My very good friend’s daughter is obsessed with owls. E and I are going to visit next week and were trying to think of good owl related gifts when E remembered that one of her favourite books as a kid had been the Two Hoots. 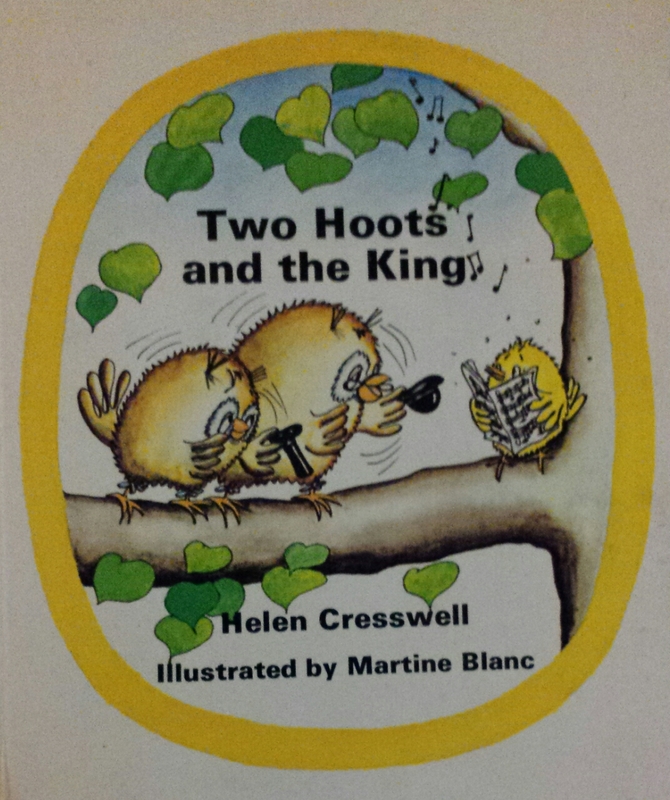 It soon became apparent that there would be tears before bedtime if we just got a Two Hoots story for my friend’s little girl without also getting one for E, and consequently last night I had the ‘pleasure’ of E reading aloud to me the ambiguous moral tale that is Two Hoots and the King. For those of you unfamiliar with the Two Hoots, the basic premise is that Big Hoot and Little Hoot are ‘daft as coots’. While all the other owls are very wise, Big Hoot and Little Hoot do silly things like staying awake in the daytime. All the other owls are very mean to them because they aren’t wise. However, both Big Hoot and Little Hoot are desperate to become wise and it is the search for wisdom which runs through this book. In this particular story, Big Hoot and Little Hoot are awake one day, longing for wisdom, when they see a bright yellow bird happily singing in the next tree. Little Hoot realises that the bird is yellow, and as the sun is also yellow concludes that the bird must be from the sun. Somebody needs to explain Venn diagrams to Little Hoot but that is not the focus of this book. Big Hoot builds on this insight by noting that as the sun is King of the Day, so too must this bird be King of the Sun. They decide to ask the Sun King for a wish and Big Hoot suggests that they ask him for wisdom. After some deliberation, E and I have concluded that Little Hoot is the dimmer of the two, although it is a close call. I don’t want to spoil the ending of this tale, but I will. They go to see the yellow bird and address him as the King of the Sun and ask for their wish. Now, rather than doing the decent thing of alerting them to their mistake, or simply flying off, or even just kindly playing along, the yellow bird promises to make them wiser, waits until they have gathered all the other owls to see and then says “I am not the King of the Sun, I am a canary! So now you are a bit wiser.” Then all the owls laugh at them and the yellow bird flies off. Tags: book, book review, books, Helen Cresswell, Owls, Two Hoots. Bookmark the permalink. This review made me laugh out loud. A great way to start the day. Humanity’s (or, at least, the mining industry’s) coldly utilitarian attitude to the canary has clearly done significant damage to their psyches. Chilling. PS: Exciiiiited about the weekend! I must confess that I hadn’t considered the tale from the canary’s point of view. We can discuss in more depth tomorrow.